Whether you need an electrical inspection, to have a backup generator installed, or some other type of electrical service for your home in the Sudbury, Massachusetts, area, VMA Electric can help. We’re an experienced residential electrician that has been providing comprehensive services for homeowners in the region for more than a decade, and we take pride in the fact that much of our work comes from repeat customers or new clients that we were recommended to. Additionally, our focus on providing unmatched service has helped us maintain an A+ rating with the Better Business Bureau for many years. 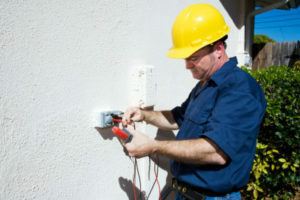 Our reputation as a reliable residential electrician is based on a variety of factors. Our electricians average more than a decade of experience and stay up to speed on industry trends and advancements so they can use that knowledge to benefit our clients. Additionally, we stand behind our work with a one-year guarantee from the date of service to give our customers added peace of mind. If you are searching for a residential electrician that you can count on to do the job right the first time, contact VMA Electric today. We serve homeowners in Sudbury, MA, and surrounding communities.